You have to feel sympathy for this lady. She is forced to lie for a living, and has to daily stand before journalists trained to find the truth. That has to be a miserable life. 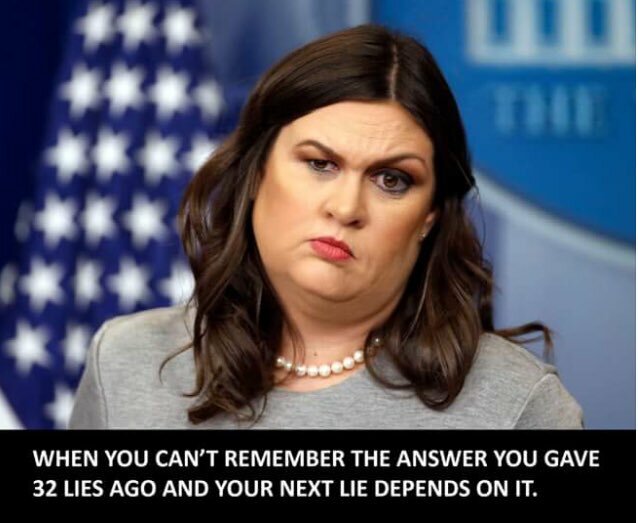 This entry was posted in News & Views and tagged answer, cover-up, credibility, journalists, lies, look, miserable, press secretary, Sarah Sanders, sympathy, truth on January 27, 2018 by Ray Buchanan. In a world of political correctness and the rule of respectability above faithfulness and doing what is right, there are far too many who do not want to hear criticism of our leadership. Isn’t this what helped folks like Hitler rise to power? The #BLOTUS is not fit to be the leader of the free world. Dan Rather has put it perfectly. It’s time for all of us to call a spade a spade and stop normalizing our current situation. The United States needs a real leader, one who realizes that the world doesn’t revolve around his rants and lies.. This entry was posted in News & Views, Quotes and tagged acquiescence, answer, BLOTUS, calling a spade a spade, cowardice, Dan Rather, free world, future generations, lies, quote, rants, silence, sophistry on April 1, 2017 by Ray Buchanan. 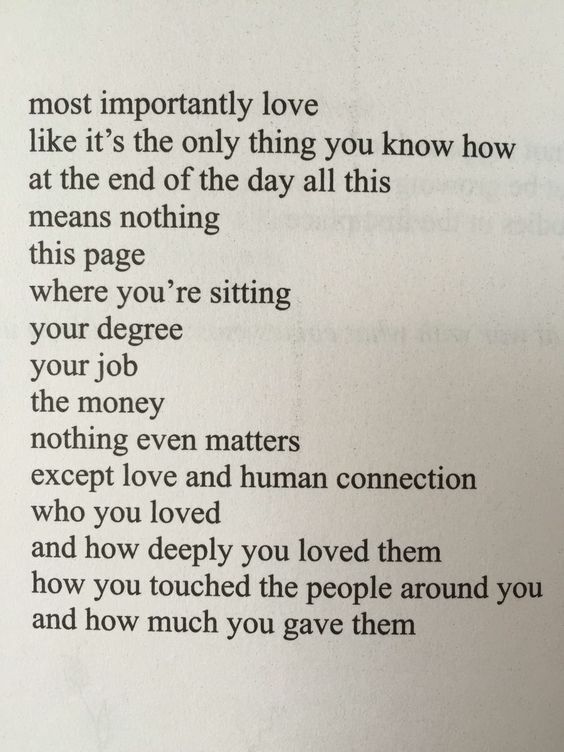 i cannot find the author of this poem, but I want to thank the writer for these thoughts. As we finish out the last few days of this year I can think of no better reminder for us. This is also the perfect focal point for looking into the new year that looms ahead of us. Love is the only thing that really matters. Nothing else comes close. If we are able to integrate these thoughts into our resolutions for the upcoming year we can change more lives than we can imagine, starting with our own. Let’s focus on demonstrating more love this coming year. Let’s love more, care more, and show more compassion for those around us in 2017. Love is the answer. Nothing else matters. This entry was posted in News & Views, Quotes and tagged answer, change, degree, human connection, job, love, money, new year, resolutions, wealth on December 29, 2016 by Ray Buchanan. And so it shall be. Jesus made it abundantly clear that our professions of faithfulness, our 25 year perfect attendance pins, and out citizen-of-the-year awards mean nothing. The examination is an open-book, take-home. It’s a single question, pass/fail. There’s one correct answer, and we’ve written it down before the examination even begins. Do we reflect God’s love to all those most in need? Our answer is either yes or it’s no. We are answering the question every day by the way we live. In the evening of our lives it’s too late for a do-over. Now is the time for us to love the least of these among us. Oh, and before I forget, this is an entrance exam. This entry was posted in Quotes, Spirituality & Religious Writings and tagged answer, award, do-over, examination, Jesus, judgement, least of these among us, love, profession of faith, Saint John of the Cross, take-home exam, test, those most in need on April 13, 2015 by Ray Buchanan.